A carved maple top on a chambered mahogany body, makes this guitar light with an amazing natural sustain and resonance. 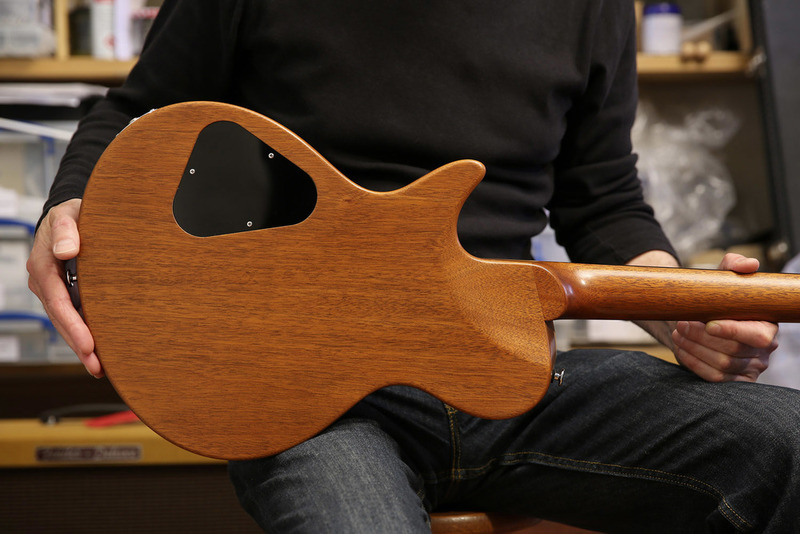 The neck is hand carved from one piece of quarter sawn mahogany, creating a very stable neck with a great feel. The ebony fingerboard has a slightly brighter response than rosewood and is inlayed in mother of pearl 'Wave' markers. All hardware is high quality and made in the US; the lightweight Pigtail wraparound bridge is fully adjustable and the Sperzel Solid-Pro tuners guarantee fine tuning and smooth operation. The guitar is fitted with high quality US made CTS pots, Switchcraft toggle switch and a pull/push tone pot for coil splitting. A 50’s wiring scheme is used to minimises treble loss when rolling back the volume. Bare Knuckle unpotted humbuckers are fitted with a 'Mule' humbucker in the neck position for its outstanding clarity, extended dynamic range and unmistakable vintage character. A 'Riff Raff' pickup is selected in the bridge position for plenty of snap and a classic range of organic, clean and driven tones.